For centuries, Ireland was under British rule. But that didn't mean that Ireland wasn't struggling for its freedom. 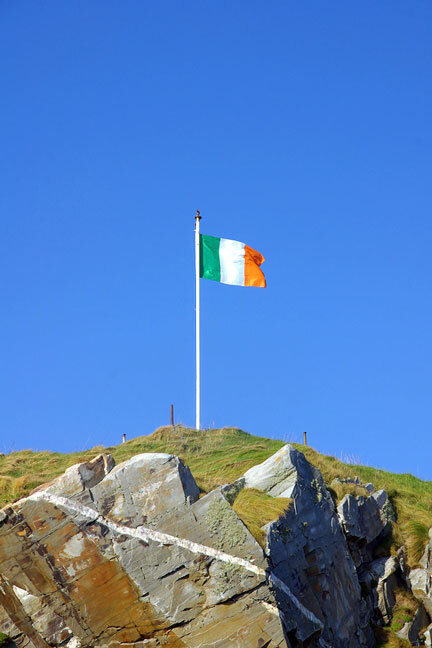 As a matter of fact, the same flag that Ireland flies today was first introduced by Irish nationalists in 1848, when they were in the midst of a revolution to secure their freedom. 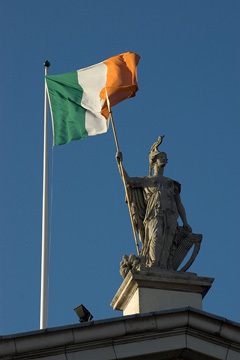 Although the flag had been flown, it wasn't recognized as the national flag until the Easter Rising of 1916. The flag was officially written into the constitution in 1937. The flag is similar to the French tricolore, but the colors are green, white, and orange. 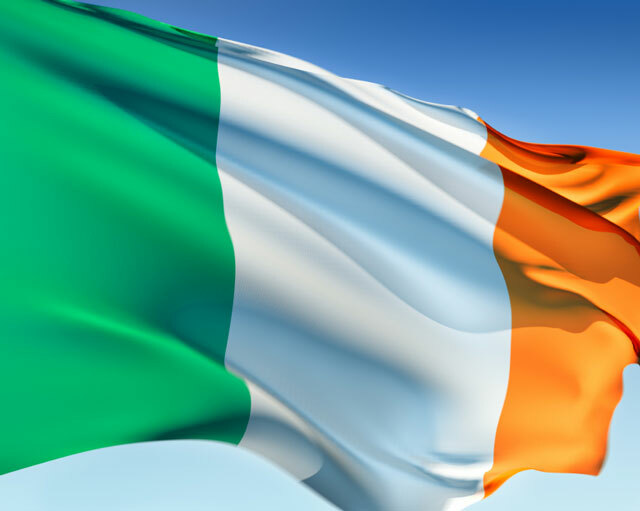 The green, which appears on the left side of the flag, represents the Catholic faith while the orange, which appears on the right side of the flag, represents the Protestant faith. The white that appears between the green and orange represents peace between the two faiths. Ireland is located in the Atlantic Ocean, off the west coast of Great Britain. It is home to 3.9 million people, about 95 percent of whom are ethnic Irish. The country's official languages are Irish and English, and its capital is Dublin. Ireland's landscape comprises low coastal ranges, lakes, hills, and peat bogs. Due to its proximity to the Gulf Stream, the climate is mild — the average temperature is 54° F — and wet. Many residents are attracted to Ireland because of its relaxed lifestyle, good healthcare, low crime rates, and good school systems. About one-third of all residents qualify for completely free healthcare, while the rest pay to visit their doctors and for prescriptions. Those who require more serious hospital care pay only a nominal fee. Most schools are run by the Roman Catholic Church, and in recent years the country has increased school spending, resulting in a highly educated and skilled workforce. Crime in central Ireland ranks among the lowest in all of Europe, although drug use and crime have become more prevalent in the urban settings of Cork and Dublin. Ireland's economy is led by its main resources of lead and zinc, but is also bolstered by efficient agriculture and food processing, foreign investments in the high-tech sector, and the export of electronics, which accounts for 25 percent of all exports. When it comes to world affairs, Ireland joined the UN in 1995, but takes a stand of neutrality in all world conflicts. Ireland remains a popular tourist attraction, drawing about six million visitors per year. In addition to the stunning scenery, "clean" environment, and friendly and relaxed people, Ireland is also known for its lake and river boat tours, equestrian vacations, and some of the world's best golf courses. For the less outdoorsy vacationer, Dublin is a popular attraction with its arts, theatre, music, and architecture. 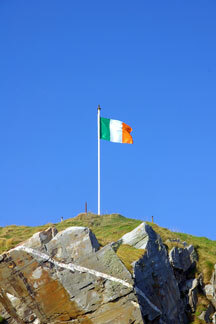 Ireland Facts - information about Ireland and its flag. Government of Ireland - information about the Irish State. Ireland Map - Ireland maps, geography, and tourism. Ireland News - news articles and facts about Ireland.